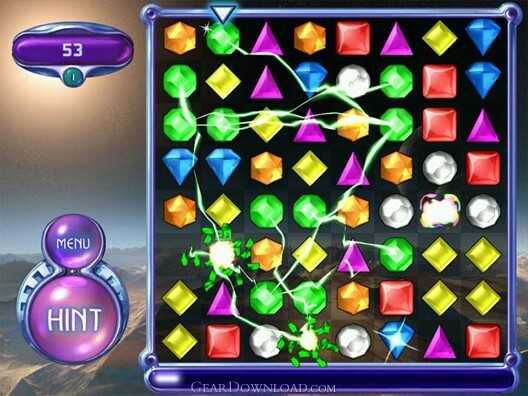 Bejeweled 2 Deluxe is the sequel of PopCap's classic Bejeweled Deluxe game. This sequel enhanced graphics and special effects, added new game modes. The original Bejeweled Deluxe is great, the Bejeweled 2 Deluxe is even better! Bejeweled 2 Deluxe is an easy "match three" genre game. You'll know how to play it at your fist sight. Although it's very easy to play, it offers various game modes and enough challenge that even skilled players can enjoy spending hours racking up high scores. Bejeweled game is so popular that you can play it on many game platforms such as XBox360, PS3, GBA or iPhone etc. Bejeweled can even be played as a plugin in online game World of WarCraft. I love this game; it is so fun to play. If I could i would play this game until I get the highest score in the world. I would beat everyone st this game if I could. Alchemy Deluxe - Transform the entire board to gold in this popular puzzle game! Bejeweled Deluxe - Take the classic game of gem-swapping to euphoric new heights! BookWorm Deluxe - Are you ready for smoking hot word-building action? Typer Shark Deluxe - Move over, Mavis... here comes the typing tutor with teeth! Seven Seas for Windows - hoy, matey! Set sail for adventure with Seven Seas for Windows. Escape Rosecliff Island - Play through three game modes in this mesmerizing hidden-object adventure.